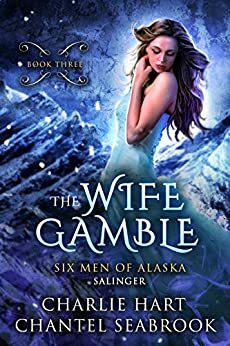 Book three in the Six Men of Alaska, The Wife Gamble: Salinger by Charlie Hart and Chantel Seabrook. Salinger and Tia have been taken by the Director to go and see someone that Salinger isn’t happy about it. Salinger and Tia are brought before his mother that most don’t even know is still alive. Tia is concerned for Giles since he was taken by the Director for the murder of the mercenaries. Miriam is a scientist that has also like Tia’s dad looking for a cure for the issues affecting the women worldwide. Salinger confines in Tia about his past and the death of his sister. Salinger learns the true identity of Tia and knows now that her past can truly put them all at risk. The pair gets to see Giles and see that he has been being tortured for information that he doesn’t even have. Tia starts to get closer to Salinger and learns about his side business that he shares with Huxley. The two get the chance to be intimate with each other finally. The others start to be jealous from the time that the two start spending together, Fallon specifically. Salinger’s mother requires that Tia goes through testing to see if she is pregnant yet and in return is willing to help free Giles from his imprisonment. While giving blood for testing, Tia and Salinger see her father that she has been hiding from. Each book in this series is written between one of the six husbands and this one is specific to Tia and Salinger. Salinger is a rather complicated character, not as complicated as Banks, but still rather deep. Salinger’s anger is written well and so is Tia’s fear. Written between two authors the transitions are smooth and it isn’t clear who wrote what. The two authors work well together as their third book comes out. Each of the guys though not from their point of view in this story adds to everything that happens. Next book is from Banks point of view so it should be an interesting read. Check out Salinger’s story here. Read Fallon’s story here and check out my review here. Read Giles story here and check out my review here.